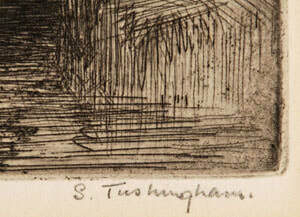 Tushingham, a painter and etcher, was born at Burslem, Staffordshire and studied at that town’s College of Art and at the Royal College of Art, London. He was elected an Associate member of the Royal Society of Painter-Etchers (RE) in 1915. During his career (he appears to have ceased exhibiting in 1938) he showed works at the RE, the Royal Academy and at numerous other galleries.